This post discusses getting a job on Wall Street, but the basic principles apply to whatever your area of interest is. Tomorrow morning I plan to go knocking on doors at different Private Equity firms in the Houston Area. Those firms do not have a career section on their website, so I have decided to go the old fashion way and knock at their door. Basically, I want to get an entre level analyst position and start from there. Today, I am starting an online MSc. in Corporate Finance, so I hope that could help me. My question to you is, what tips would you suggest me when I go tomorrow morning? would that strategy work? I receive many emails like this. Early in my career, at one point, I actually went door to door and managed to get a job on Wall Street that way, but it is extremely difficult. You have to be prepared for lots of rejection, you have to know, going in, everything about the job and firm that you are attempting to get an interview at. You have to be clever, pushy and lucky to get past the receptionist and you then have to make your points, powerfully and succinctly, as to why you would be a good fit for the firm. Then you have to be prepared and have answers to any objections. Did I mention accomplishing all this is not easy? An alternative might be to contact smaller firms by email or phone, contact the partners, and tell them you are willing to work for free for 6 months to prove yourself. Be a pest. I also like the idea of working for a temp agency. Befriend someone at an agency and tell them that you are willing to work as a temp in the PE industry, hedge fund industry etc., whatever it is you are interested in, because you want to get in the door. Once you are in the door, you can be judged on your skills. Be a pest at the temp agency, so that you are on their mind. Another strategy is to start a blog, not an opinion and policy blog like mine, but a blog that shows your skills in the field you would like to enter. If you want to get into the PE industry, write one or two analytical posts per month that analyze sectors of the economy and why it may make sense for the PE industry to get involved in those sectors (or why they should be avoided). If you consider yourself, say, a good stock analyst, then start a blog where you post one or two detailed stock research reports each month. Email links to your posts to the people you would like to work for. I know of two analysts that got their starts this way. When all is said and done, it’s about being clever and focused and knowing well the person/firms you want to work for, so that you can show them the skills you have that can help them. “When I first met her I thought, ‘Oh my gosh, this girl’s scaring me, she’s so professional,’” said Teresa Hsiao, a classmate at Harvard College. “Her idea of fun may not be what we consider fun, like looking at 10-Ks,” the annual reports filed with securities regulators. Cool, who declined to be interviewed for this article, met Buffett through Smart Woman Securities, the group she and Hsiao founded while Harvard undergraduates. SWS aims to educate members about everything from compound interest to preparing a pitch to prospective investors. Think about this. She set her sights on working for Warren Buffett and accomplished that! How many people would kill to get a job next to Buffett? A lot. But she did it. Why? Because she did many things that others don’t do. She had a methodical plan. She developed her skills that would make her valuable to Buffett and then she developed a plan to get in front of Buffett so that she could demonstrate her skills. Alice: Yes, I will give away some of my secrets. People would do well to study investigative journalism. Read something like Den of Thieves or A Civil Action and try to reverse engineer how it was reported. Here are three other great books on conversing with people, understanding their real motives, and just generally understanding how the human mind works. The Craft of Interviewing by John Brady. The Zen of Listening by Rebecca Shafir. The time pressures that work against quality research are also well-known. You write-up a lot of inconsequential things, especially what I call “elevator notes” (this quarter “X was up and Y was down”). Instead of writing original or probing views, you are really incentivized to spend as much time as possible marketing. Also, if you adhere to consensus, it does protect your career. There’s an old saying that no one ever got fired for buying from IBM. Nobody ever got fired for making a wrong estimate that was within sell-side consensus. Whereas, if you break from consensus, you really can’t afford to be wrong very often. That phenomenon really drives the sell-side. It can be overt, such as when we were judged on how “commercial” our work was. This is a veiled threat, because, of course, our work has to be marketable in order for us to have a job. The firms essentially want two things that are incompatible. Alice: One trap is not probing deep enough to really answer whether a particular investment opportunity is a good business. It’s easy to make a facile judgment about that based on a summary description of a business. The sheer breadth of different business and investment opportunities in a modern capital market creates an overflow of information that leads many investors to have short attention spans in thinking about companies comparatively. Curiosity is an inherent kind of arbitrage that no amount of computer technology can overcome. Warren makes it sound so simple to know what is and is not a truly good business – and great business do resonate very clearly when you understand why they are great and especially when they’ve been identified as successful investments by an investor like Warren Buffett and proven so with hindsight – but like many things in investing, Buffett makes it sound easier than it is. When it comes to appreciating something that is special about a business that others do not, I’ve learned that the devil really is in the details. Miguel: How is Warren different from other value investors? Alice: He’s more interested in money, for one thing (laughs). In terms of how that affects his investing behavior, number one, in his classic investments he expends a lot of energy checking out details and ferreting out nuggets of information, way beyond the balance sheet. He would go back and look at the company’s history in-depth for decades. He used to pay people to attend shareholder meetings and ask questions for him. He checked out the personal lives of people who ran companies he invested in. He wanted to know about their financial status, their personal habits, what motivated them. He behaves like an investigative journalist. All this stuff about flipping through Moody’s Manual’s picking stocks … it was a screen for him, but he didn’t stop there. Number two, his knowledge of business history, politics, and macroeconomics is both encyclopedic and detailed, which informs everything he does. If candy sales are up in a particular zip code in California, he knows what it means because he knows the demographics of that zip code and what’s going on in the California economy. When cotton prices fluctuate, he knows how that affects all sorts of businesses. And so on. The third aspect is the way he looks at business models. The best way I can describe this is that it’s as if you and I see an animal, and he sees its DNA. He isn’t interested in whether the animal is furry; all he sees is whether it can run and how well it will reproduce, which are the two key elements that determine whether its species will thrive. I remember when his daughter opened her knitting shop. Many parents would say, I’m so proud of Susie, she’s so creative, this is something of her own, maybe she can make a living at it. Warren’s version is, I’m so proud of Susie, I think a knitting shop can produce half a million a year in sales, they’re paying whatever a square foot for the storefront, and labor is cheap in Omaha. It was similar when Peter was producing his multimedia show, The Seventh Fire. Many parents would say, wow, my son has pulled off a critically acclaimed show. Warren obviously thought that, but what he articulated was, they’re charging $40 a ticket, I think the Omaha market is too small for that price point, whereas in St. Louis they may cover the overhead, and I think he paid too much for the tent because the audience doesn’t really care what kind of tent it’s sitting in and it hurts margins, etc. A special situation since there is a change in Board. If ABX can survive its balance sheet by improving its low cost assets, then there could be 100% to 200% upside with gold prices above $1,250. 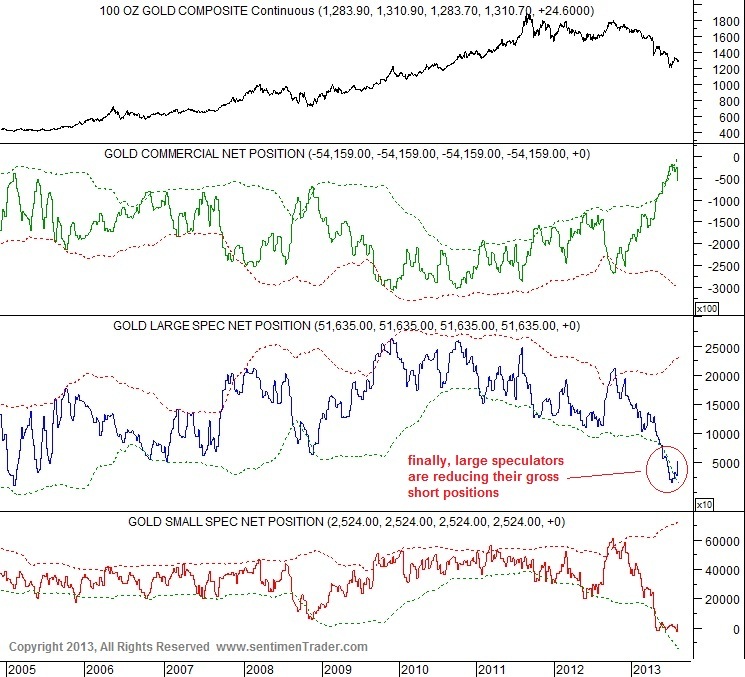 Right now we are in tax selling as well as a weak gold environment. ABX’s management says they will pare down/sell off their high cost mines. If gold goes sub- $1,000, then ABX could really struggle. How individuals like Jay Gold, Daniel Drew, and Commodore Vanderbilt made their fortunes. Book: Fifty Years in Wall Street (1859 to 1900) https://www.hightail.com/download/bWJxTG05R0Z1Yk5Yd3NUQw Thanks to a generous contributor. The book is worth reading for a feel of Wall Street during the 19th Century and for learning that human nature does not change especially on Wall Street. Add this to your Reminiscences of a Stock Operator from the last post http://wp.me/p2OaYY-26h. You now have reading material on Wall Street (1850 to 1930) from the speculators’ point of view. Place this in your financial history section of your learning library! A review: I was very much looking forward to this book – to be able to read a comprehensive and organized treatise on Buffett’s many philosophies and strategies. What a disappointment! Be warned that the book is nothing but tidbits and random bits and pieces of articles written about him (and a few by him) over the last 46 years. But don’t expect to learn anything you probably already didn’t know. I received the dropbox keys to a treasure chest of 80 books so I will parcel out over the next few weeks. If you find any books that helped you become a more insightful investor, then please let me know so I can share with the group. Thanks. Buffett began acquiring shares of the Washington Post in early 1973, and by the end of the year held over 10 percent of the non-controlling “B” shares. After multiple meetings with Katherine Graham (the company’s Chairman and CEO), he joined the Post’s board in the fall of 1974. According to Buffett’s 1984 speech The Superinvestors of Graham-and-Doddsville, in 1973, Mr. Market was offering to sell the Post for $80 million. Buffett also mentioned that you could have “…sold the (Post’s) assets to any one of ten buyers for not less than $400 million, probably appreciably more.” How did Buffett come to this value? What assumptions did he make when looking at the future of the company? Note: All numbers and details in this article are from the 1971 and 1972 annual reports and “Buffett: The Making of an American Capitalist” by Roger Lowenstein. The purpose of this exercise is to reverse engineer Buffett’s analysis of the Washington Post Company—in other words, to construct a reasonable analysis given the facts as of 1973 that will lead us to the same conclusion Buffett arrived at. Readings: So You Want To Be Like Buffett. I am keeping this epic cover. A top in Central Banking confidence. “In a speech in Rome, ECB President Mario Draghi said the bank would monitor incoming data closely and be ready to cut rates further, including the deposit rate currently at zero. While……..China and other Asian countries buy on dips. I don’t buy the gold bugs premise that central banks will back their currencies with gold unless forced to by the market/the public. However, central bankers buying may indicate the lack of trust in their colleagues’ fiat currencies. 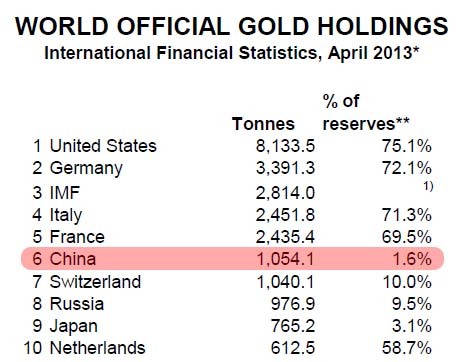 Also, gold “flowing” East represents a wealth transfer from West to East. [T]he financial system (including the institutions themselves, products traded, and risks taken) has “gotten away from” the Fed’s ability to comprehend. The Fed is primarily responsible for that state of affairs, and it is out of its depth. Former Chairman Greenspan created — and reveled in — a cult of personality centered on himself, and in the process created a tremendous and growing moral hazard. 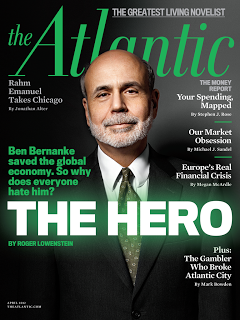 By successive bailouts and purporting to understand (to a higher and higher level of expressed confidence) a quickly changing financial system of growing complexity and leverage, he cultivated an ever-increasing (but unjustified) faith in the Fed’s apparent ability to fine-tune the American (and, by extension, the world’s) economy. Ironically, this development was occurring at the very time that financial innovations and leverage were making the system more brittle and less safe. He extolled the virtues of derivatives and minimized the danger of leverage and risky securities and dot-com stocks, all while he should have been putting on the brakes. It was not just the disappearance of vast swaths of the American financial system into unregulated subsidiaries of financial institutions, nor was it just government policies that encouraged the creation and syndication of “no-documentation” mortgages to people who could not afford them. It was also the low interest rates from 2002 to 2005, the failure to see the expanding real estate bubble caused by an unprecedented increase in leverage and risk, and the general failure to understand the financial conditions of the world’s major institutions. Under Chairman Bernanke, the combination of ZIRP and QE completed the passage of the Fed from sober protector of a fiat currency to ineffective collection of frantically-flailing, over-educated, posturing bureaucrats engaged in ever more-astounding experiments in monetary extremism. If you look at the history of Fed policy from Greenspan to Bernanke,you see two broad and destructive paths quite clearly. One path is the cult of central banking, in which the central bank gradually acquired the mantle of all-knowing guru and maestro, capable of fine-tuning the global economy and financial system, despite their infinite complexity. On this path traveled arrogance, carelessness and a rigid and narrow orthodoxy substituting for an open-minded quest to understand exactly what the modern financial system actually is and how it really works. The second path is one of lower and lower discipline, less and less conservative stewardship of the precious confidence that is all that stands between fiat currency and monetary ruin. Monetary debasement in its chronic form erodes people’s savings. 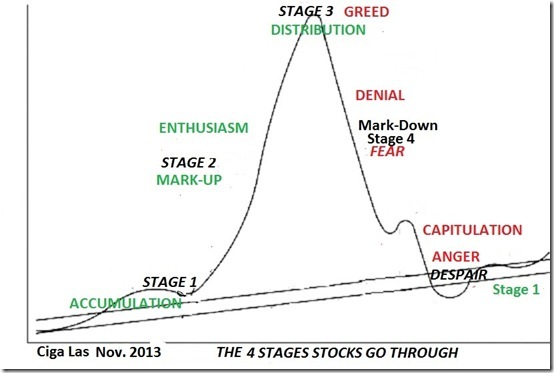 In its acute and later stages, it can destroy the social cohesion of a society as wealth is stolen and/or created not by ideas, effort and leadership, but rather by the wild swings of asset prices engendered by the loss of any anchor to enduring value. In that phase, wealth and credit assets (debt) are confiscated or devalued by various means, including inflation and taxation, or by changes to laws relating to the rights of asset holders. Speculators win, savers are destroyed, and the ties that bind either fray or rip. We see no signs that our leaders possess the understanding, courage or discipline to avoid this. It is true that the CEOs of the world’s major financial institutions lost their bearings and were mostly oblivious to their own risks in the years leading up to the crash. However, as the 2007 minutes make clear, the Fed was clueless about how vulnerable, interconnected and subject to contagion the system was. It is not the case that the Fed completely ignored risk; indeed, several Fed folks made “fig leaf” statements about the risks of the mortgage securitization markets, as well as other indications that they appreciated the possibility of multiple outcomes. But nobody at the Fed understood the big picture or had the courage to shift into emergency mode and make hard decisions. In the run-up to the crisis the Fed was a group of highly educated folks who lacked an understanding of modern finance. After convincing the nation for decades of their exquisite grasp of complexities and their wise stewardship of the financial system, they didn’t understand what was actually going on when it really counted. Ultimately, of course, as the system was collapsing and on the verge of freezing up completely, the Fed shifted into the (more comfortable and much less difficult) role of emergency provider of liquidity and guarantees. All this background presents an interesting framework in which to think about what the Fed is doing now. QE is a very high-risk policy, seemingly devoid of immediate negative consequences but ripe with real chances of causing severe inflation, sharp drops in stock and bond prices, the collapse of financial institutions and/or abrupt changes in currency rates and economic conditions at some point in the unpredictable future. However, the lack of large increases in consumer price inflation so far, plus the demonstrable “benefits” of rising stock and bond markets, have reinforced the merits of money-printing, which is now in full swing across the world. In the absence of meaningful reforms to tax, labor, regulatory, trade, educational and other policies that could generate sustainable growth, “money-printing growth” is unsound.We believe that the global central bankers, led by the Fed as “thought leader,” have no idea how much pain the world’s economy may endure when they begin the still-undetermined and never-before attempted process of ending this gigantic experimental policy. If they follow the paths of the worst central banks in history, they will adopt the “tiger by the tail” approach (keep printing even as inflation accelerates) and ultimately destroy the value of money and savings while uprooting the basic stability of their societies. 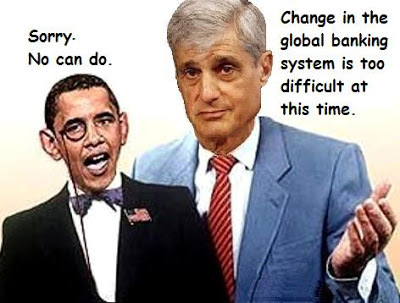 Read the 2007 Fed minutes and you will understand how disquieting is the possibility of such outcomes and how prosaic and limited are the people in whom we have all put our trust regarding the management of the financial system and the plumbing of the world’s economy. Printing money by the trillions of dollars has had the predictable effect of raising the prices of stocks and bonds and thus reducing the cost of servicing government debt. It also has produced second-order effects, such as inflating the prices of commodities, art and other high-end assets purchased by financiers and investors. But it is like an addictive drug, and we have a hard time imagining the slowing or stopping of QE without large adverse impacts on the prices of stocks and bonds and the performance of the economy. If the economy does not shift into sustainable high-growth mode as a result of QE, then the exit from QE is somewhere on the continuum between problematic and impossible. Central banks facing high inflation and/or sluggish growth after sustained money-printing frequently are paralyzed by the enormity of their mistake, or they are deranged by the thought that the difficult and complicated conditions in a more advanced stage of a period of monetary debasement are due to just not printing enough. At some stage, central banks inevitably realize, regardless of whether they admit the catastrophic nature of their own failings, that the cessation of money-printing will cause an instant depression. Even though at that point the cessation of money-printing may be the only action capable of saving society, that becomes a secondary consideration compared to the desire to avoid immediate pain and blame. The world’s central banks are in very deep with QE at present, and the risks continue to build with every new purchase of stocks and bonds with newly-printed money. 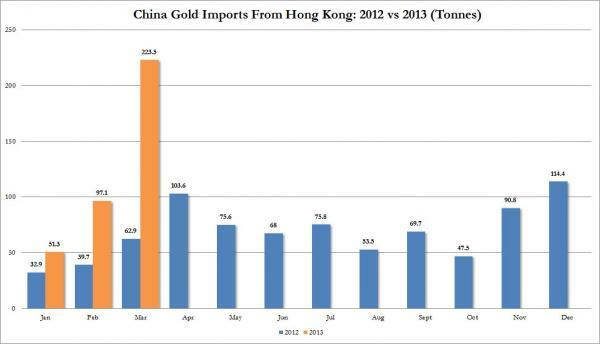 There are many current theories as to why the price of gold had been drifting down and then collapsed in mid-April. We are trying to sort out various possible explanations, but we urge investors to be cautious in their thinking about what circumstances would likely cause gold to rise or fall sharply. The correlations with other assets in various scenarios (risk on or off, economic normalization, inflation, the rise and fall of interest rates, euro collapse) may shift abruptly as the macro picture evolves. Many people think that if stock markets continue rising, and/or if the U.S. and Europe restore normal levels of growth and employment, then the rationale for owning gold is weakened or destroyed. This perception may be correct, and it is certainly a topic that is currently much discussed, but ultimately another set of considerations is likely to dominate. 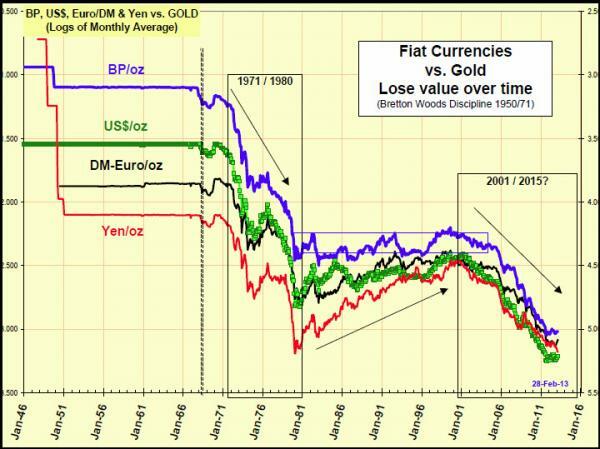 The world is on a seemingly one-way trip to monetary debasement as the catchall economic policy, and there is only one store of value and medium of exchange that has stood the test of time as “real money”: gold. We expect this dynamic to assert itself in a large way at some point. 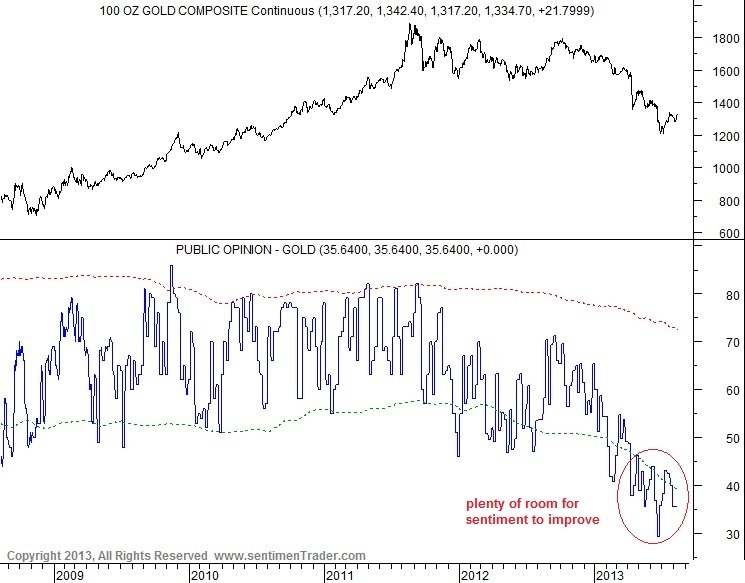 In the meantime, it is quite frustrating to watch the price of gold fall as the conditions that should cause it to appreciate seem more and more prevalent. 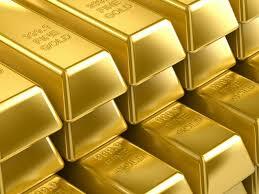 Gold may not exactly be a “safe haven” in the sense of an asset whose value is precisely known and stable. But it surely is an asset that, in a particular set of circumstances, becomes a unique and irreplaceable “must-have.” In those circumstances (loss of confidence in governments and paper money), there are no substitutes, and the price of gold may reflect that characteristic at some point. This book will no doubt go into the proverbial dustbin of history along with Dow 36,000. Ask yourself some honest questions and then compare your answers to this book’s entire premise. 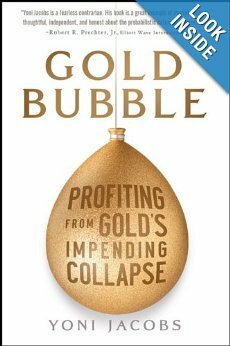 Is gold in a bubble? Well, what do bubbles look like? Luckily, we have two recent examples, the housing bubble, and the tech stock bubble in the late 90’s. What did those look like? To me, they looked like everyone was getting rich in techs stocks and flipping houses. Regular people were quitting their jobs and day trading or flipping houses full time. The average guy, the little guy, sometimes referred to as the ”dumb money” was making an easy fortune. Now, how many of your friends own any gold and talk about it with you? How much do you own? The writer points to all the publicity around gold, like those ads telling people to sell their gold. And ever since gold hit $1,000, people were doing just that, selling their gold. In a bubble, those people would be loading up, but they’re selling! The world’s central banks, the smartest people in the world when it comes to money, are the big buyers. This would be the first bubble in history that the dumb money was selling into and the smartest money on the planet was buying. Do you really think that the people with the least knowledge about money are getting this right? It would also be the first bubble to happen with almost no participation from the general public. This could be the weakest analytical book written this year. Just because the price of something is up does not mean it’s in a bubble. If you look at the average selling price of gold in the year it peaked for the last bull cycle, 1980, or $660 an ounce, and look at today’s price, the average annual gain for that 32 years is about 3%. 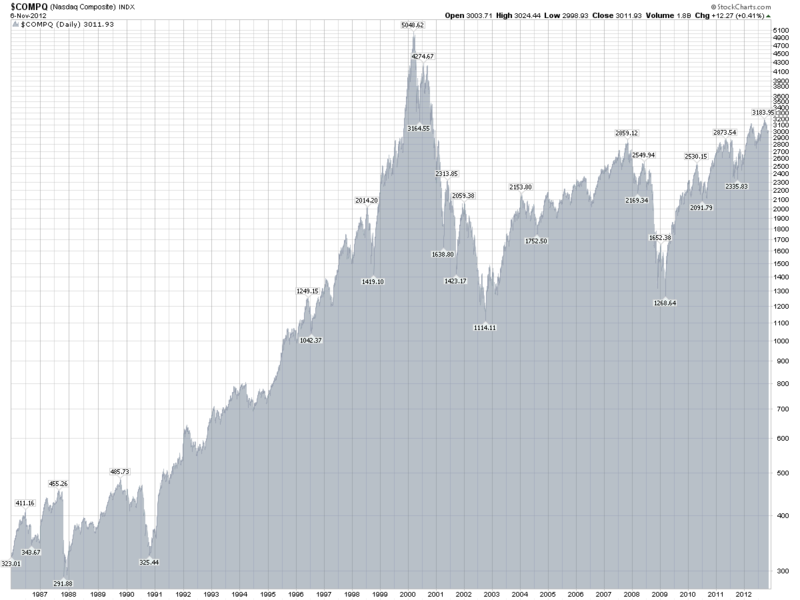 If stocks had risen by 3% annually for that long, would anyone be calling it a bubble? Then look at our trillion dollar deficits and the growth in the Fed’s balance sheet, total government debt of $18.5 trillion when you include state and local debt that as taxpayers, we’re all on the hook for, and there’s your bubble, and the best reason to defend yourself by owning gold. I came across your website via your interview with Classic Value Investors. I like the way you try to help people learn the craft. Value investing is in principle not that difficult, as long as you have a good teacher. So well done! On my own value investing blog (http://www.valuespreadsheet.com/value-investing-blog). I try to share my knowledge on the subject as well, but not per sé with case studies like you do. However, your approach is very informative for readers, so maybe I should try that some more. Thanks for the above contributions. When taxes change, would-be investors will certainly change their decisions about where to direct capital, even “though the companies’ operating economics will not have changed adversely at all.” Buffett saw this clearly in 1986, with respect to Berkshire’s own investment decisions; it’s hard to believe that Buffett no longer believes that today, with respect to private investors. It’s a catchy opener, attracting headlines and guffaws from the expected quarters. But I’m struck by his opener because I can think of at least one real-world example in which a rich investor nearly spiked a deal due to taxes: Warren Buffett himself, as recounted in Alice Schroeder’s terrific biography, The Snowball (pages 230-232). Finally, the board capitulated. But with victory finally at hand, Buffett nearly scuttled the deal because of … taxes. As Schroeder recounts, quoting Buffett, one director proposed that the company just cleanly break the company, despite the tax consequences—”let’s just swallow the tax,” he suggested. Buffett was willing to walk away from a deal because the taxes would have taken too much of a bite out of it. 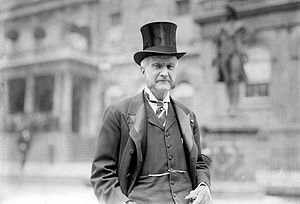 Between 1951 and 1954, when the capital gains rate was 25 percent and marginal rates on dividends reached 91 percent in extreme cases, I sold securities and did pretty well. In the years from 1956 to 1969, the top marginal rate fell modestly, but was still a lofty 70 percent — and the tax rate on capital gains inched up to 27.5 percent. I was managing funds for investors then. Never did anyone mention taxes as a reason to forgo an investment opportunity that I offered. Under those burdensome rates, moreover, both employment and the gross domestic product (a measure of the nation’s economic output) increased at a rapid clip. The middle class and the rich alike gained ground. So let’s forget about the rich and ultrarich going on strike and stuffing their ample funds under their mattresses if — gasp — capital gains rates and ordinary income rates are increased. The ultrarich, including me, will forever pursue investment opportunities. That’s not the only time that taxes played a major role on Buffett’s decisions, as recounted by Schroeder. Later in the book (pp. 533-534), she recounts how Buffett chose to structure his investments under Berkshire Hathaway’s corporate umbrella, rather than as part of his hedge fund’s general portfolio, precisely because of the tax advantages. If Berkshire, for example, were to be liquidated – which it most certainly won’t be — shareholders would, under the new law, receive far less from the sales of our properties than they would have if the properties had been sold in the past, assuming identical prices in each sale. Though this outcome is theoretical in our case, the change in the law will very materially affect many companies. Therefore, it also affects our evaluations of prospective investments. Take, for example, producing oil and gas businesses, selected media companies, real estate companies, etc. that might wish to sell out. The values that their shareholders can realize are likely to be significantly reduced simply because the General Utilities Doctrine has been repealed – though the companies’ operating economics will not have changed adversely at all. My impression is that this important change in the law has not yet been fully comprehended by either investors or managers. And, wow, do we have plenty to invest. The Forbes 400, the wealthiest individuals in America, hit a new group record for wealth this year: $1.7 trillion. That’s more than five times the $300 billion total in 1992. In recent years, my gang has been leaving the middle class in the dust. This outrage points to the necessity for more than a simple revision in upper-end tax rates, though that’s the place to start. I support President Obama’s proposal to eliminate the Bush tax cuts for high-income taxpayers. However, I prefer a cutoff point somewhat above $250,000 — maybe $500,000 or so. But the reform of such complexities should not promote delay in our correcting simple and expensive inequities. We can’t let those who want to protect the privileged get away with insisting that we do nothing until we can do everything. Our government’s goal should be to bring in revenues of 18.5 percent of G.D.P. and spend about 21 percent of G.D.P. — levels that have been attained over extended periods in the past and can clearly be reached again. As the math makes clear, this won’t stem our budget deficits; in fact, it will continue them. 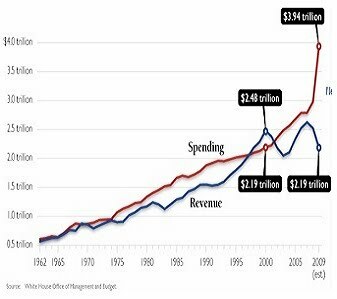 But assuming even conservative projections about inflation and economic growth, this ratio of revenue to spending will keep America’s debt stable in relation to the country’s economic output. In the last fiscal year, we were far away from this fiscal balance — bringing in 15.5 percent of G.D.P. in revenue and spending 22.4 percent. Correcting our course will require major concessions by both Republicans and Democrats. All of America is waiting for Congress to offer a realistic and concrete plan for getting back to this fiscally sound path. Nothing less is acceptable. 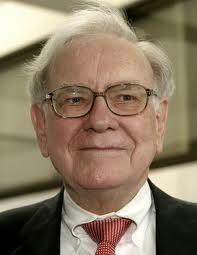 “Warren Buffett has made a lot of money, some of it off of gaming the political system. He invests in insurance companies and then lobbies to raise the death tax, which drives people to buy insurance. You can get rich playing that game but it’s all corrupt,” Norquist said. “It’s not investing; it’s playing crony politics and economics. That’s a shame. He’s done the same thing with some green investing. Shame on him for gaming the system and giving money to politicians who write rules that make your assets go up. The back-and-forth between Norquist and Buffett comes as legislators seek to come to an agreement on a deficit-reduction package to avoid the “fiscal cliff” of spending cuts and tax increases set to hit next year. A number of Republicans have indicated that they could disregard supporting the Americans for Tax Reform pledge in order to reach a deal. Buffett, an outspoken supporter of President Obama, published an op-ed in the Times in 2011 arguing that the tax rates on the wealthiest Americans should be higher. The Obama administration subsequently began pushing for a “Buffett Rule” that would raise the marginal tax rate for some of the wealthiest Americans. Obama has since called for increasing the tax rate on incomes above $250,000 a year. The Buffett Rule also introduces a base 30 percent tax rate for incomes between $1 million and $10 million and a 35 percent rate for incomes over $10 million.